Shoulder joint pain can come from any of a variety of directions, from shoulder arthritis to sports injury to shoulder tendonitis. Population-wise, most joint pain in a shoulder is going to come from osteoarthritis...which is a long term result of chronic tendonitis of the shoulder. Sports injury can injure a joint, and infection can threaten, but the bulk of shoulder issue is from the wear and tear dysfunction from daily life and normal function of the pain causing dynamic. The symptoms of a shoulder joint pain issue depend on the CAUSE of the joint pain. Do you have a Shoulder Arthritis issue? If so, is it osteoarthritis or rheumatoid arthritis? Shoulder Rheumatoid arthritis can cause pain in one or both shoulders. It is due to an auto-immune response to poor gut ecology, and can affect any joint. Achey, inflammed, painful to move or at rest. This of course kicks in a tendonitis Pain Causing Dynamic if you didn't already have one. Shoulder Osteoarthritis is a direct result of the tendonitis Pain Causing Dynamic. Things get tight and stay tight, the shoulder joint gets compressed, and that over time irritates and then damages the joint. Achey, inflammed, painful to move. Shoulder tendonitis, or more accurately, the shoulder tendonitis dynamic, is to blame for much if not most of shoulder joint pain, sooner or later. Later, in that it causes osteoarthritis. Sooner, in that the accompanying lack of function sets a person up for shoulder joint injury. Either way shoulder tendonitis consists of progressive tightness and inflammation, and that can lock a shoulder joint down in immobility and agony. True Frozen Shoulder is when calcium deposits into the joint and (sometimes) temporarily fuses the joint. This is HIGHLY problematic, painful, and debilitating. But people also call a scenario where their shoulder hurts too bad to move the same label, even when there's no calcification. This scenario is also problematic, painful, and debilitating, but not as bad as when calcification in the shoulder joint itself fuses the joint. This can be calcific tendonitis but doesn't have to be. The shoulder tendonitis dynamic can get SO BAD that it locks the shoulder down in tightness and pain. The following shoulder joint issues are 100% fixable (unless there is too much damage or bone deformity involved, but even then the mechanism can be reversed). The pain, inflammation, joint irritation and pain allegedly caused by osteoarthritis is really caused by the tendonitis dynamic. Remove the tightness, inflammation, and nutritional lack, and osteoarthritis can heal or at least stop getting worse. If there is too much damage to the joint lining and/or bone of the joint, then there's no reversing that. But the progressive mechanism causing the symptoms and damage can be stopped and reversed. Rheumatoid Arthritis (RA) is a systemic issue where damaged gut ecology leads to an auto-immune response that attacks the joints. Fix the gut, stop the progression (and daily damage) of RA entirely. Your doctor won't tell you that, though, as s/he thinks that RA is incurable. Shoulder impingement is a scenario where too tight muscle and connective tissue pull the shoulder down into itself which compresses nerve and/or blood flow to the arm. Just another flavor of the shoulder tendonitis mechanism...tight muscles getting tighter and doing their thing. 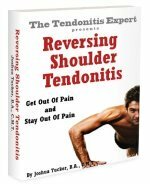 Shoulder tendonitis is in fact a simple mechanism to reverse. Don't be tricked into thinking that shoulder tendonitis is a complex or difficult problem to solve just because your doctor doesn't know how to fix it (much less what causes it). Shoulder tendonitis is made up of (primarily) three factors: Muscle and connective tissue tightness, inflammation, and nutritional lack. Once you know how, it's easy to fix. A shoulder bursitis issue isn't technically 'joint pain', even though it's right there on the joint. But bursitis is fixable. When a shoulder dislocates the upper arm bone pops out of it's cup shaped shoulder socket. This rarely requires surgery, but usually requires some sort of medical attention, at least the first time it happens. And it will likely happen again as the force applied to pop the shoulder out of joint by necessity also stretches the ligaments and joint capsule holding the joint together. Once ligaments are stretched, there's no returning to their former length/strength/structural stability. People can learn to live with a shoulder whose joint has dislocated, and can strengthen the muscles holding the shoulder together, but it's likely that the shoulder joint will hurt at least sometimes as the extra movement causes irritation to the joint. When osteoarthritis or rheumatoid arthritis is active for too long and progresses too far, the shoulder joint can become deformed. Once the boney structure of a shoulder joint changes shape, there's no going back (short of surgery). Once the joint lining is degenerated and gone, then its bone on bone. And the constant inflammation is still in play. Both cause pain. Both (can) cause bone to change it's shape (both disappearing in some areas and growing newly in some other areas (that it's not supposed to be. Obviously this change in bone structure changes the ability of a joint to move, and move through it's range of motion. Eventually the separate bones of the joint can even fuse together. This is when the collar bone separates from the shoulder blade. Or more medically, when the clavicle separates from the acromion. Also called an 'AC separation', this isn't the shoulder joint per se, but it's mighty close. Like a true shoulder disclocation, the force that separates the bones also stretches the ligaments and joint capsule, but for this AC separation there is almost always tearing of those once-supportive structures. Unlike true shoulder dislocation, a shoulder separation requires surgery, whereas a disclocation can usually just be tugged back into place. After surgery and recovery, like can be pain free....but the structural integrity of the AC joint is weakened, and future irritation and constant inflammation is a likelihood. For the most part, shoulder joint pain is reversible. Some issues 100% so, some scenarios less so. Depending on your scenario, there's good news. And generally no matter where you're at, you can make it better. Return to the top of this Shoulder Joint Pain page.